Wedding Bush (Ricinicarpos pinifolius) above the Capertee River gorge. The junction of the Wolgan and Capertee gorges can be seen in the right background. In 1994, deep in a remote gorge of Wollemi National Park, bushwalker David Noble and three friends stumbled upon the 'dinosaur tree' that became the Wollemi Pine - a survivor from a distant time before flowering plants came to rule the Earth. It turned out to be a whole new genus of a Southern Hemisphere conifer family that includes Chile's monkey puzzle tree and Australia's Norfolk Island pine. And it amazed botanists around the world. But to those who knew Wollemi, it wasn't so surprising that such a 'lost' species should turn up there. This tangle of creeks and ridges extends 130 km from Bells Line of Road to the Hunter Valley and has always been a blank space on the map. Spreading north from what is usually understood as the Blue Mountains, it was a place with no name. The puzzle of Wollemi confounded colonial surveyors. They were despatched again and again to map the unknown terrain, only to struggle in the impassable ravines, seemingly random cliffs and grasping scrub. Major Clews was one of the last, in the 1930s. He tried to resolve the country west of the Colo River, which he called the 'bad bit across the river'. But Wollemi was not finally mapped accurately until air photographs became available in the 1960s. Back then, it was 'vacant Crown land', a 'no man's land', touched by a few graziers, loggers and bushwalkers, used for army training, crossed by a few fire trails that were carved after the big fires of 1957. 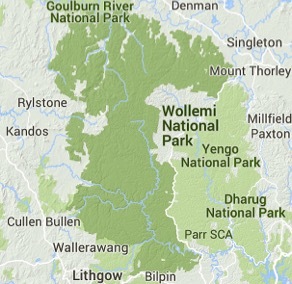 Despite these localised impacts Wollemi includes the largest wilderness (361,000 hectares) in eastern mainland Australia outside Cape York Peninsula. How could such a wilderness survive, right on the doorstep of Sydney, Australia's largest city? 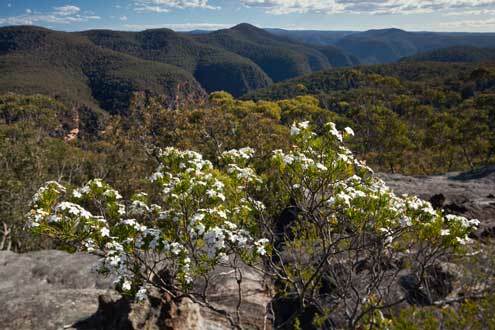 Mainly because Wollemi has been protected by a combination of rugged terrain and limited agricultural potential. Like most national parks, it was the land no-one else wanted. But in the 1970s this began to change. Wollemi started to attract other possibilities. First it was a shale quarry on the Culoul Range, above the Colo River gorge. 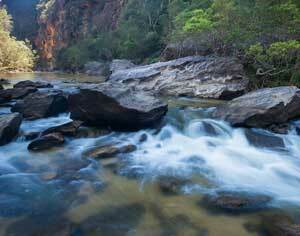 Then it was a plan to dam the iconic Colo River itself, to supply water to a new power station on the Newnes Plateau. These ideas arose at a time when environmental concern was growing rapidly in the community, and conservationists were fighting to protect wilderness across Australia. Coming after successful campaigns against limestone mining and pine plantations in wild lands of the southern Blue Mountains, environment groups rallied to protect Wollemi. Another conflict arose over the future of the coal seams that lie under the whole area. But in 1979, in an unprecedented move which recognised the outstanding conservation values of the area and prevented all mining, the New South Wales Government declared Wollemi National Park to the centre of the Earth. Wollemi today protects over 500,000 hectares of wild country - the largest reserve in the Greater Blue Mountains World Heritage Area and one of the largest national parks in New South Wales. It remains a mysterious land of endless wooded ridges, twisting cliff-bound gorges and blue horizons. New discoveries continue to be made, discoveries that prove it was not so mysterious to the First Australians. 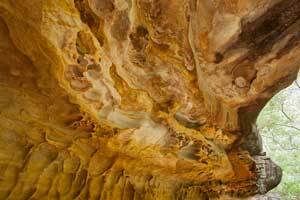 In 1995, deep in the Wollemi Wilderness, bushwalkers found a sandstone overhang with a massive display of Aboriginal art. Some years later, archaeologists and Aboriginal people went to investigate the cave and gave it the name of Eagle's Reach. They discovered many more sites and realised that Wollemi held an enormously rich cultural heritage. Hundreds of sites of varied, complex and beautiful art have now been recorded. The art is even more valuable because it is mostly well preserved away from modern impacts and exists within its original bushland environment. Research and contemporary Aboriginal opinion suggest that Wollemi has long been a very special place, and an area where various groups seem to have come from different directions, especially the Darug, Wiradjuri and Darkinjung. Wollemi may be rugged and mostly untracked, but it has many places for visitors to easily enjoy. You can camp and canoe at Dunns Swamp, explore industrial ruins in the Wolgan Valley, walk through the Glow Worm Tunnel, camp amongst the blue gums at Wheeny Creek, gaze into the wilderness from lookouts like T3 and Crawfords and walk to the Colo River on Hungerfords Track. Colo River rapid in winter shadow. The Colo River has carved the reputedly longest gorge in NSW, at about 100 km, and drains a massive area of dissected sandstone which is also the largest Wilderness Area in the state - and indeed on the eastern Australian mainland. All the major Colo tributaries also flow though dramatic and colourful gorges, including the Wolgan, Capertee, Wollemi, Wollangambe, Nayook and Bungleboori. Warm temperate rainforest in the headwaters of Wollemi Creek. Although most of Wollemi National Park is covered in a vast open forest of mixed eucalypts, long green tendrils of rainforest shelter in the narrow gorges. The cliffs act to protect the rainforest from drying sun and wind, and even fire. 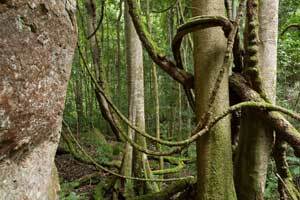 In turn, these rainforest 'trenches' act as barriers to break up the run of wildfires. In a couple of such gorges the Wollemi Pine has found refuge and managed to survive to the present day. 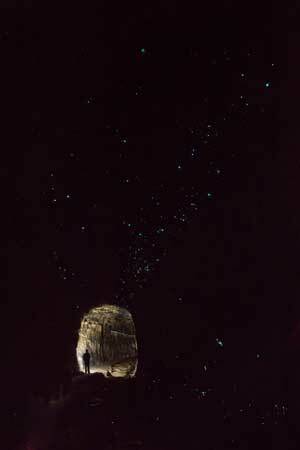 Glow Worms burn like stars on the damp roof and walls of the Glow Worm Tunnel. Glow Worms are actually quite easy to find - if you're prepared to spend time under damp sandstone overhangs at night. An easier option is this abandoned walk-through tunnel of the old Newnes Railway, one of the most popular visitor sites in Wollemi but a longish drive across Newnes Plateau from near Lithgow. These Glow Worms are the larvae (grub) of a fungus gnat, Arachnocampa richardsae. Bioluminescence attracts tiny prey like mosquitoes, which are then snared on sticky, web-like threads. 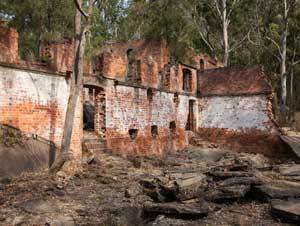 Ruins of the Newnes Industrial Complex. These paraffin sheds are part of what was, in its heyday, the largest industrial complex in Australia. Construction to extract various products from the local oil shale (found as layers in the Permian sediments at the base of the Sydney Basin) began in 1906 and the works finally closed in 1932. Beset with industrial and technical problems, the project was never a success. The massive works were demolished and cannibalised for new works at Glen Davis, salvage and scrap. Today the forest grows over the site, the Wolgan River runs relatively clean again and visitors wander wide-eyed through the ruins. 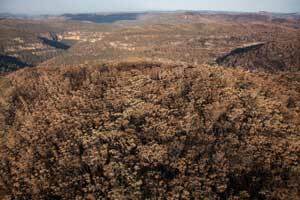 In the spring of 2013 the State Mine Gully Fire started at Marrangaroo near Lithgow and, driven by strong dry westerly winds, swept across Newnes Plateau and halfway across Wollemi National Park before remote area firefighters and rain brought it to a halt some weeks later. This aerial view looks south-eastward over the Wollangambe River gorge to Mount Tootie on the right. Fire is a vital part of Wollemi ecology, but the overall picture is as complex as this image which shows the fire burnt at variable intensity depending on terrain, vegetation and weather conditions at the time. Fire can be both ecological friend and foe, and we have not yet come to terms with how human communities can best cope with it as a natural force. 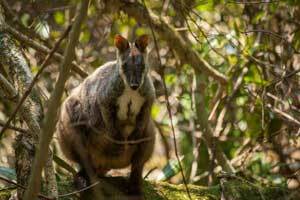 Wollemi National Park is one of the last NSW strongholds for this enigmatic and engaging macropod. Listed as threatened, Brush-tailed Rock-wallabies are widespread in the gorge country, but mostly in low numbers and rarely seen. Several more populous colonies in the Wolgan and Capertee valleys have been studied for a number of years. They are doing well, assisted with baiting to remove their main enemy, the European Fox. To see their acrobatic rubber-balling amongst the rocks is to witness magnificent adaptation. Weathered sandstone overhang above the Wollangambe River. Sandstone is one of the most wondrous and beautiful of all rocks, so mercurial and so colourful, so productive of amazing shapes and landforms, and so redolent of its fluid origins. Overhangs like this are commonplace in Wollemi, many of them used for shelter by Aboriginal people for millennia and, where the rock is less crumbling, decorated with their art. Eagle's Reach in remote Wollemi is perhaps the most lauded such gallery, but just one of thousands of rock art sites in the Greater Blue Mountains World Heritage Area.